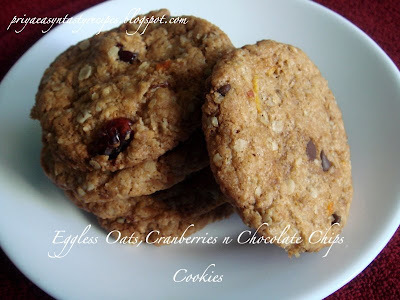 Eggless Oats, Cranberries N chocolate chips cookies with orange rinds tastes really marvellous also this cookies r extremely easy and they will vanish also very easy..while i started preparing these cookies, i wanted to make cookies just with all purpose flour n oats with dried cranberries, but at last i added few chocolate chips to the dough..they r eggless n also vegan coz i used just canola oil n egg replacer powder.. 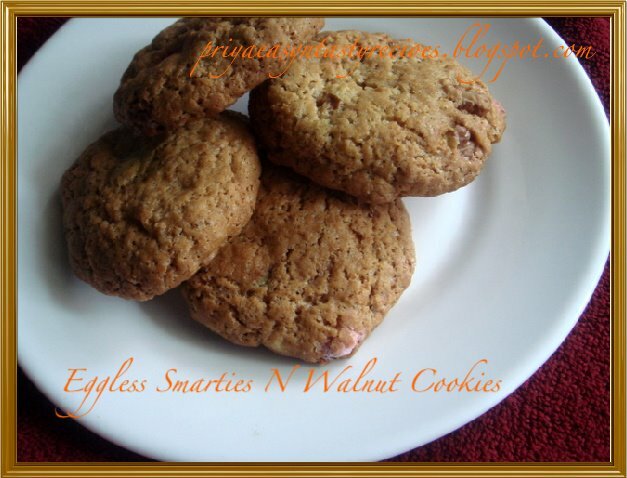 Delicious Cookies with awesome flavours!!! I love having chettinad dishes very much, here comes one more dish another authentic gravy from chettinad, i came across this gravy here, i did few changes with this gravy, they turned out really awesome.. we enjoyed having this delicious curryleaves kuzhambu with fried papads..needless to say how delicious they r! !..the original recipe was made by sauting the curry leaves, while sauting they may lose certain important vitamins, its better to use fresh curryleaves also i used shallots instead of usual onions...Curryleaves r very good for hair n usually helps for stopping hair falling, its has been recommended to take daily the few curryleaves which can help to reduce hair falling. Dry roast all the ingredients from the list 'To Grind' one by one slowly except the curry leaves...grind all the roasted spices with curry leaves into fine paste...keep aside..
Heat the gingelly oil in a kadai, add the mustard seeds n cumin seeds n let them splutters,saute the shallots, chopped tomatoes n garlic together until the oil get separates..add the tamarind juice to the kadai with enough salt, once they starts boiling add the grounded paste to it, cover the kadai with lid n keep in simmer n cook until the oil separates from the gravy also the gravy turns thicks.. 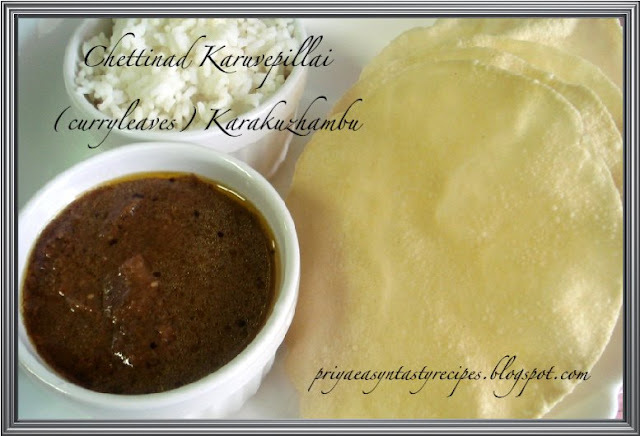 Delicious Karuvepillai Karakuzhambu is ready, enjoy with hot steaming rice with fried papads!!!! 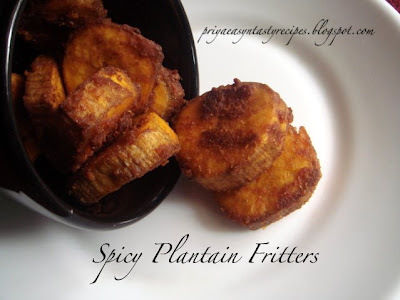 Heat the oil for shallow fry n drop the plantain pieces one by one n fry them until they turn brown n well fried.. 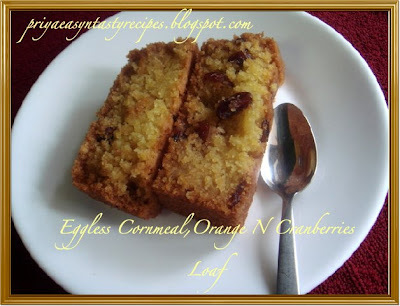 Recently i bought in Indian Grocery a bottle of Lion's Dates syrup, just to make my morning breakfast a bit healthy rather than having coffee, as usual finally i have once a week the dates syrup with my hot milk,half of the bottle was still laying in my pandry, i really wanted to finish the dates syrup as something delicious,i tried this eggless apple cake with dates syrup n maple syrup by reducing sugar...initially i was a bit confused to use dates syrup for this cake but my curiousity pulled me to prepare this apple cake with dates n maple syrup...also i added half a cup of grated apple pieces to the batter made the cake more delicious by adding cinnamon powder...This eggless cakes vanished within few minutes n finished it as today's breakfast...My husband who doesnt like to have cake for breakfast picked two pieces to have with his coffee, am very happy to see this apple cake turned out quite delicious n also healthy...i made this cake with my heart shaped cake pan, just for my beloved family with healthy stuffs in it. 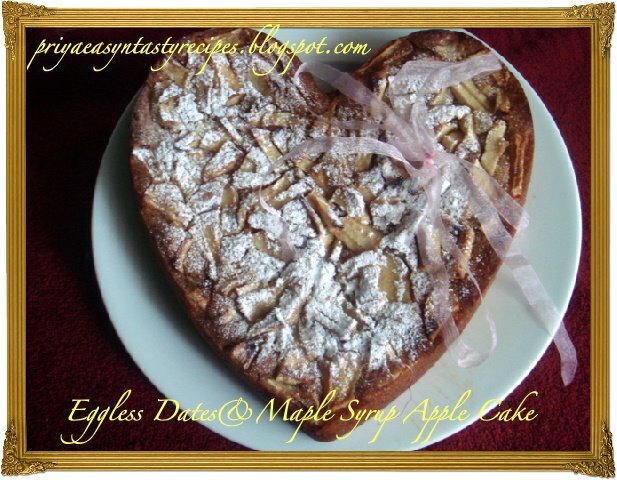 Healthy Eggless Dates & Maple syrup Apple Cake!! 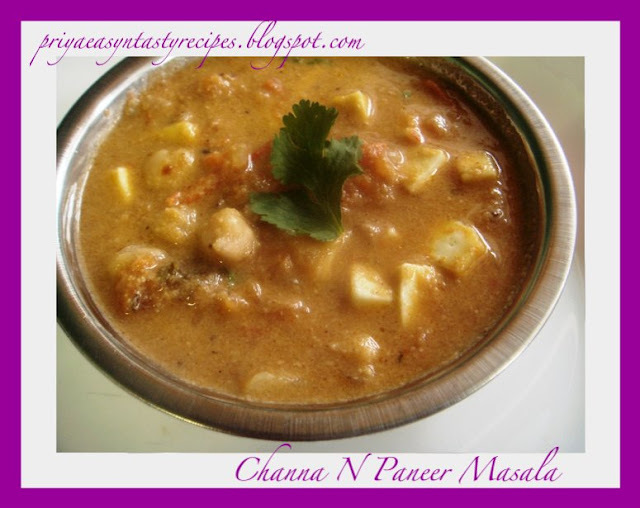 Soak the chickpeas overnite r atleast for 6hours...Grind coarsely the soaked chickpeas in a blender with fennel seeds, cloves n ginger pieces.. add the chopped onion, chopped chilly pieces,chopped coriander leaves to the chickpeas batter with enought salt..preheat the oven for 350F..place a baking sheet over a baking tray...take a small ball from the batter n flat them in ur palms ...brush the baking sheet with oil, place the flattened vada, leave spaces between them..bake them by turning on both sides with a wooden spatula upto 25-30 minutes r until they turns brown on both sides.. 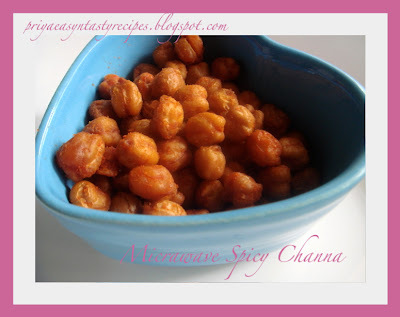 Serve them hot with any chutneys!!!! 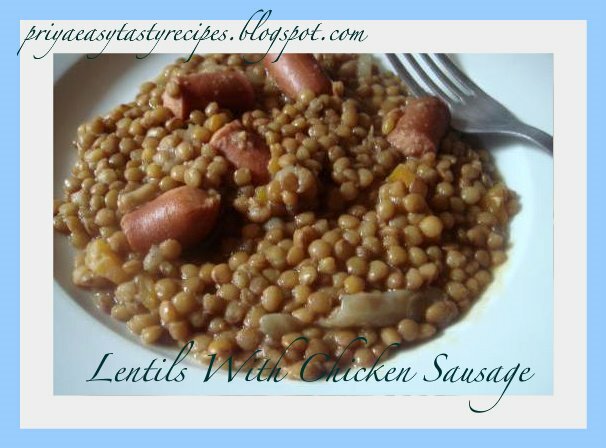 Barley contains high levels of dietary fiber and selenium (a type of antioxidants). Recent studies showed that a diet high in beta-glucan from barley helps lower blood LDL cholesterol (the bad cholesterol). Barley may also help stabilize blood glucose levels, which may benefit people with diabetes.Barley was used by ancient civilizations as a food for humans and animals, as well as to make alcoholic beverages. In addition, barley water has been used for various medicinal purposes since ancient times. 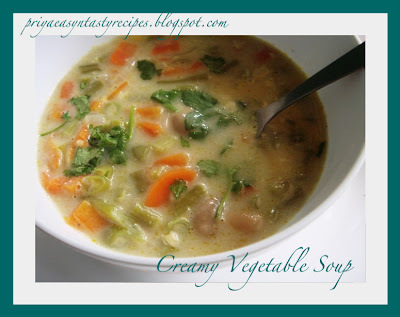 In this soup i used barley water to prepare the soup instead of vegetable broth which makes this soup much healthier.. 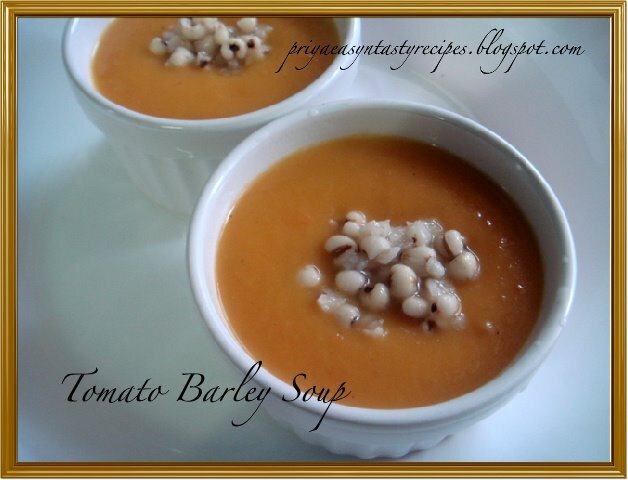 Blend them as soup with hand blender...serve the soup with cooked barley.. 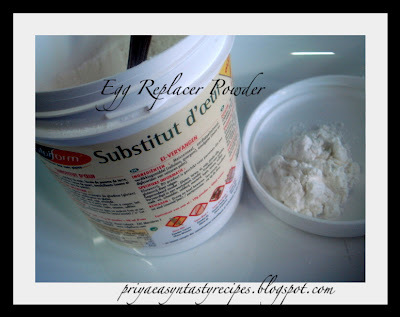 When i bought the egg replacer powder, i wished to try almost all bakes as soon as possible n i was really very curious how they gone to be turned with the egg replacer powder..As usual am very much excited to prepare bakes with this egg replacer powder n tried scone, bread, cookies also am gonna try muffins for this weekend, u know wat its almost everyday my kids come back home after the school asking wat their mom would have done today for their snacks, they were really happy to find all these eggless delicious bakes for their snacks instead of usual snacks..Yesterday i prepared this eggless cookies with walnut n smarties, it was a big hit at home..Smarties are a colourful sugar-coated chocolate confectionary popular in Europe..smarties can be replaced very well with M&M's. Make a soft cream with sugar, brown sugar, butter n canola oil,also the thick paste of egg replacer powder mixed with warm water, meanwhile sieve both all purpose flour n whole wheat flour with baking powder and baking soda..add gradually the dry ingredients with smarties n walnuts pieces to the creamy butter n sugar mixture, knead them slowly as soft dough...line a baking sheet over a baking tray...preheat the oven at 350F..take a small ball from the dough n flat them with ur palms n place them over the baking sheet..leave some space between the unbaked cookies..
Heat the oil in a pan, add the cumin seeds n let them splutters, add the chopped tomato,onion n saute them until they turns mushy, add the spiced tomato puree with salt, coriander powder, pepper powder n red chilly powder, cook them in simmer, after a while, add the cooked channa n fried paneer cubes with the coconut milk..bring it to boil n cook again in simmer for a few minutes..
Garnish with chopped coriander leaves, serve hot with rotis!! 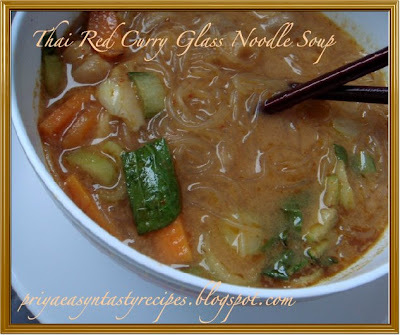 Thai soups r always delicious, i have seen this soup in a Thai cookbook, this soup was quite bit spicy n very delicious, also creamy coz of coconut milk, initially the original recipe is with shrimps and vegetables, i skipped as usual the shrimps in this soup ..Its kinda hard to find out vegetarian recipes in thai cuisine, sometime we will be happy to see vegetarian dishes but the ingredients they used to prepare that particular dish will contain either fish sauce r shrimp paste, i hardly came across vegetarian recipes, needless to say that i skipped the meat r seafood they used to prepare thai dishes.. .this spicy glass noodle soup will be very prefect while its very cold and this spicy glass noodle soup goes to AWED - Thai by DK of Culinary Bazaar..
One more entry for MBP - Easy Breezy Breakfast guest hosted by EC, event started by Coffee..i have seen this coconut poha at Suma'sVeggie Platter ..This easy breezy breakfast need just few minutes to prepare n its quite easy, u doesnt need to chop vegetables r sauting them etc, just wat u need is thick poha n tempering ingredients... as Suma told the addition of coconut makes the poha more delicious... 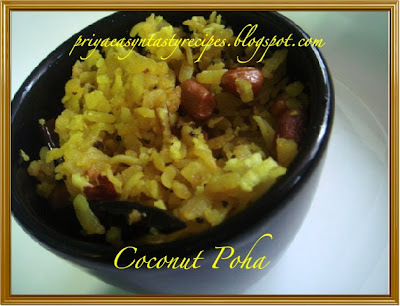 This delicious poha also goes to Aquadaze's Lets Go Nuts event as this recipe is made with peanuts..Also on the way to FIC - Yellow event by Sunshinemom of Tongueticklers ..
Cornmeal (ground maize) is an excellent source of iron, zinc, B vitamins and magnesium. Along with sago, quinoa, buckwheat, rye, barley, oats, tapioca and cassava, it can provide a useful wheat alternative if you feel you have a wheat intolerance. Cornmeal flour can be used to make bread or muffins. A coarser grind is also used to make polenta, a popular Italian dish. Cornmeal and polenta can be stored in airtight container in the refrigerator for upto 3 months and can be frozen for 6 months.Cranberries are actually a type of acidic berries that are rich in vitamin C and believed to contain excellent infection fighting properties. 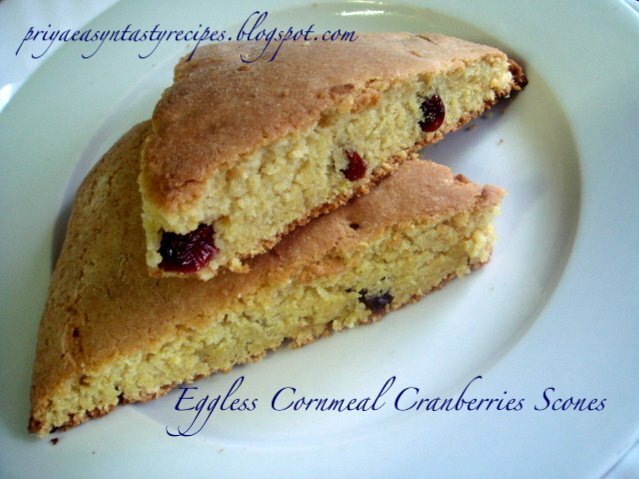 This eggless cornmeal cranberries scones goes to Egg Replacement Event - Egg Replacer Powder by Madhuram.. 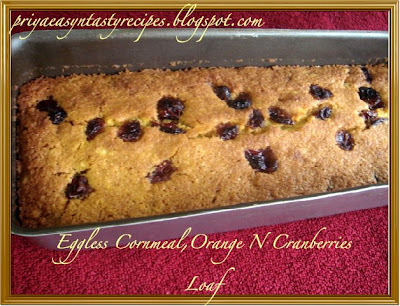 Beat vegetable shortening, canola oil n sugar together until soft n fluffy, make a paste with egg replacer powder n warm water..mix together all purpose flour, cornmeal, baking soda n baking powder..add the flour to the sugar mixture also the egg replacer powder paste n the cranberries too n knead them as soft dough, can springle water if needed to knead as dough...preheat the oven at 350F..
Take a baking tray n place a baking sheet springle all purpose flour , now place the dough n roll with rolling pan, brush the dough with milk n cut the dough as triangles..bake them for 20-25minutes until they turn brown.. Delicious Scones, best for breakfast!!!! Shallots are much better for cooking than normally onions, especially for those who are not keen on the strong onion flavour, shallots are much sweeter than onions and the body can digest them much easier. As the shallot is actually the bulb of the plant, often the top leafy part can go to waste and be thrown away, but these are full of vitamins (these green are known as scallions), and can be used in salads or cooked in other ways. 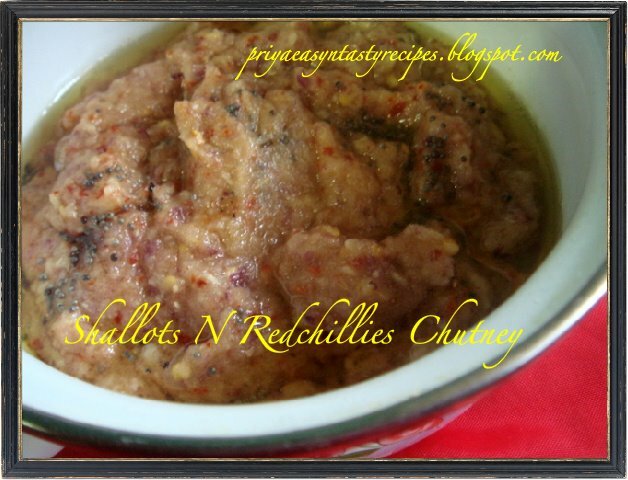 The shallot itself is very high in vitamin C, potassium, fibre, folic acid, calcium, iron and is also a good source of protein, which makes it especially good for vegetarians and vegans...Shallots contain two types of sulphur compounds Allypropyldisulphine (APDS) and flavoniods such as quercetin. People who consume a lot of flavoniods have been shown to have a reduced chance of developing cancer, heart disease and diabetes, due to the wonderful antibacterial properties they process. As an added benefit they are also anti-inflammatory, antiviral, and anti-allergenic. Heat few drops of gingelly oil , saute shallots, redchillies, tomato pieces, garlic for 5 minutes, grind into coarse paste with enough salt, this chutney will be very spicy..heat again the rest gingelly oil n add mustard seeds n curry leaves n let them splutters...add them to the hot chutney.. 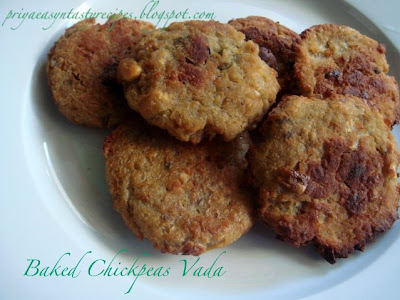 Serve them as side dish for Idlies n dosas!!!! 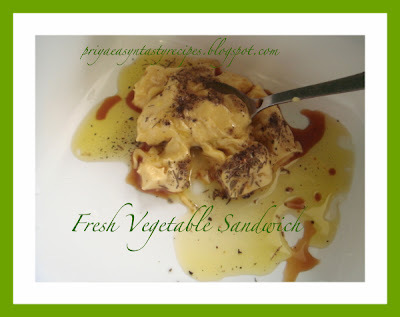 Serve hot with any side dish!!! 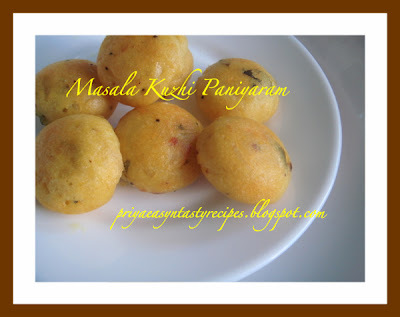 Mix the egg replacer powder n 4tbsp warm water into thick paste.Beat both sugar, packed brown sugar n vegetable shortening until soft..add now the persimmon puree,baking powder, baking soda, raisins and finally add the ragi flour, rolled oats n all purpose flour with milk n knead into soft dough.. 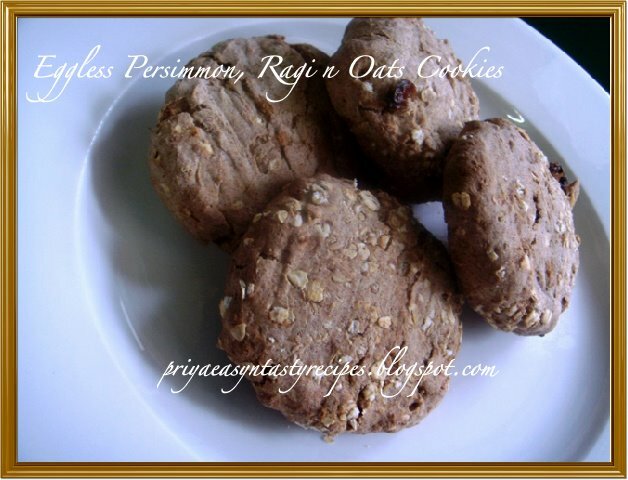 Delicious Eggless Persimmon, Ragi n Oats Cookies!!!! 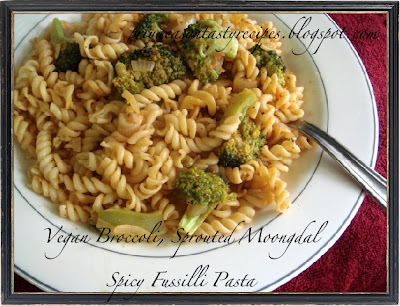 Need something spicy also vegan, u should give a trial to this pasta with broccoli n sprouted moongdal...we love pasta with any sort of sauce, but Vaishali of Holycow announced a event called Vegan Italian , she was asking to prepare something as vegan that is without cheese, cream, without meat n butter etc...i prepared this fusilli pasta with olive oil without butter r cream..Its quite a healthy dish n everyone at home loved this tasty past dish...Also am sending this pasta to Jyoti's Pasta Party..
Heat the olive oil in a kadai, add the crushed garlic pods n chopped onion pieces n saute them until the onion turns transculent...now add the tomato puree, sprouted moongdal with pepper powder, dry thym leaves n paprika powder..bring them to boil, keep in simmer n cook for a while...meanwhile saute the broccoli with few drops of olive oil in a pan , keep aside..broccolis should be crunchy..now add the cooked pasta to the cooking tomato sauce n toss them, finally add the already sauted broccolis n put off the stove..
Loaf them as per ur wish n serve them with hot coffee!!!! Am very much excited to post this recipe coz i prepared this pineapple curry similar to which i had few days back in Thai Restaurant...i just went through a Thai Cookbook and got hooked with this hot n sweet curry....i served this thai pineapple curry with thai jasmin rice... actually this dish is with chicken, but i skipped the chicken n added carrot, capsicum, bamboo shoot pieces...This is a quick easy thai curry dish which is bit sweet n very spicy, i became addicted to this dish..also i used storebought green curry paste to prepare this dish so needless to say how easier the dish is....This dish goes to AWED-Thai by DK.. Serve over the cooked rice n enjoy !!!!. Wash both Rice with split moongdal together n add three cups of water n pressure cook with grated ginger n salt upto 3 hisses.. Meanwhile heat the ghee in a kadai, add the cumin seeds, curry leaves n cashew nuts n fry them until they turns brown, add immediately the chopped vegetables with pepper powder n 1/4tsp salt (beware we have already added salt in rice)..n saute them for a while, close with lid n keep the flame in simmer, let them cook for a while..the vegetables should be cooked but not mushy..
Pat dry the cooked channa with a paper towel n take them in a bowl...Add the red chilly powder, enough salt n oil to the channa n mix them well, let them marinated for few minutes..Arrange the marinated channas as single layer in a microwave plate n heat them in high temperature for 5 minutes, continue again for another 5 minutes..mine is done within 10 minutes..time may varies according to ur microwave..
Spicy Channa is ready to munch..Finish them within a day!!! 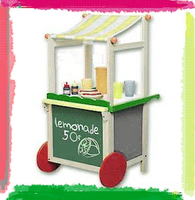 Goes to EFM: Microwave Oven Series by Srilekha.. 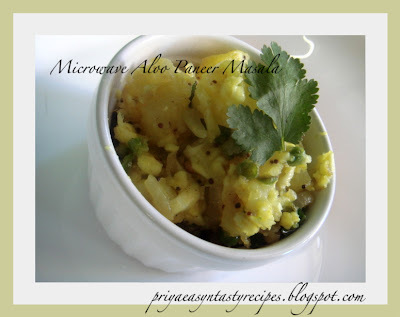 This Bread poha also goes to Just For You Event by Alka as i prepared again this poha for my little one who loved this bread poha very much, even i took this picture while i prepared for the second time..
We r Rasam family!! 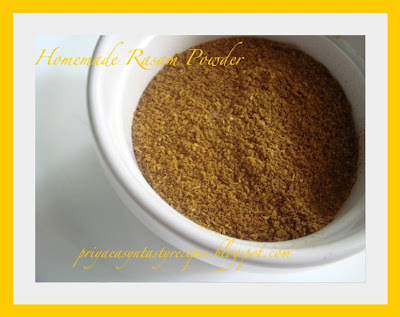 everyone at home love rasam , store bought rasam powder wont stay for a while for us..i usually prepare rasam powder once a month n they will finish quite within a month too..i follow each n every steps to prepare this powder as my mom used to do..this is my mother's version of rasam powder, mostly peoples used to prepare rasam powder dals n spices but my mom used to add fenugreek seeds and curry leaves to give a fantastic aroma to this powder n we follow this method since a long...This homemade rasam powder goes to Colors of Taste Powders event by Smitha of Kadumanga..
Dry roast one by one everything without oil in simmer except the turmeric powder..let them cool n grind as bit coarse powder with turmeric powder...conserve them in air tightened bottle..serve them as per ur need..
Bring boil sugar n agar agar powder n keep in simmer until the sugar n agar agar powder get dissolved...put off the stove, add the rose syrup n rose water n stir again well...pour the rose syrup in ice cubes tray n arrange them in fridge for atleast 2 hours..
Scoop out the jelly n serve them!!!!! Chettinad cuisine is famous for its use of a variety of spices, the dishes are hot and pungent with fresh ground masalas, this tomato kurma also prepared with a variety of spices too, this kurma goes awesome as side dish with rice, also with idlies, dosais, rotis...i loved this bit tangy tomato kurma simply with fried papads..just enjoyed it..sure if u try this tomato kurma am damn sure that u wont stop having them, quite a delicious dish!!!!!.. 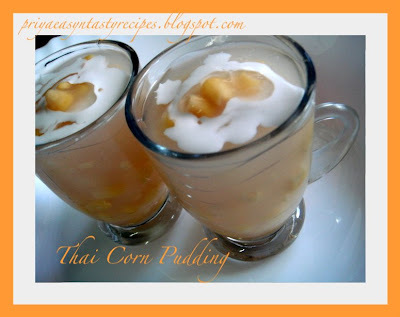 Bring boil water, sugar n corn kernels together... make a fine paste with tapioca flour n water, once the sugar get dissolved, add this paste to the corn n stir it continously until they get thick..mix the coconut cream n salt together n bring boil over low heat, put off the stove..
Wash thoroughly the potatoes n cut them as small medium pieces, put them in ziplock bags, makes small holes on the ziplock bags r punch them with sharp knife n cook them in high temperature for 5 minutes...at this time they will get well cooked, remove the skin n mash them slightly..take a microwave bowl, add the oil , mustard seeds with cumin seeds n fry them in high temperature for 2 minutes, add the chopped onion, ginger pieces with salt n turmeric powder again for 4minutes...now add the cooked potatoes, grated paneer, chopped chilly pieces n mix everything well , keep again for 10 minutes in medium temperature.. garnish the masala with chopped coriander leaves..
Stir them continously until the oil get separates, now just mix the cooked rice to the masala n toss them gently until they get well mixed.. I like to share this award with my blogger's friends, this award goes to Happy cook , Mahima ,Ramya ,Cham, Divya ,Viji ,Rekha ,Curry Leaf ,PG,Keerthana,Kitchen Flavours,Adlak's Kitchen .. 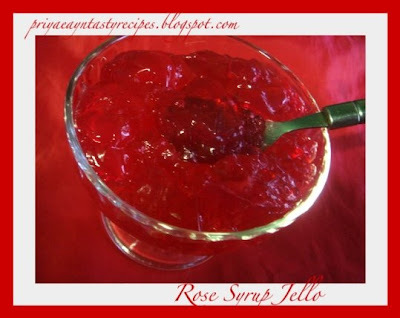 Mix vinegar, sugar and salt in a pan, bring to a boil, strain and allow to cool. 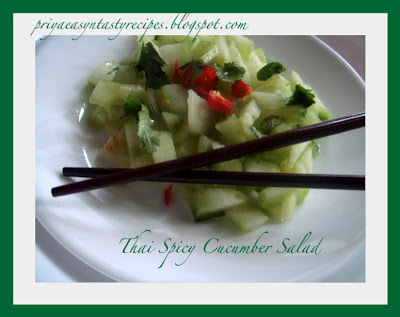 Add cucumber pieces, coriander leaves and chili pieces just before serving and add the vinegar mixture. 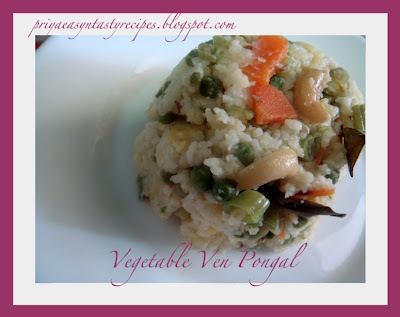 Serve them as salad with any Thai dish!!! 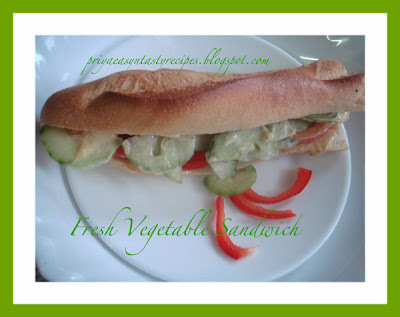 Are you searching for something tasty not spending more time in frying also very fast??? 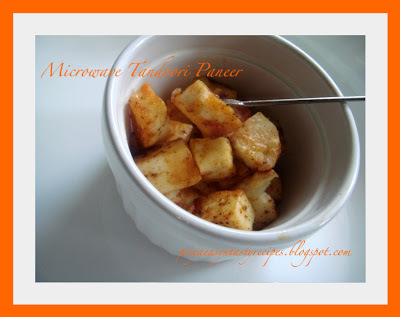 u should try this tandoori paneer, i just was thinking wat to prepare for MEC - Paneer host by Rak's Kitchen, event started by Srivalli, this tasty appetizier came to my mind, but i never tried tandoori paneer ever before, as am curious n very interested to prepare this tandoori paneer i just went through as my mind was thinking for...intially i was planning to prepare this tandoori paneer with bell peppers, but am out of stock so i prepared with spices n marinated them for few hours n prepared them in microwave, u wont believe that it just took 5 minutes for me to make this tandoori paneer also they vanished within few minutes, even ppls at home didnt let me to take this pic..goes to Healthy Bite by Rachana of The Gourmet Launchpad.. 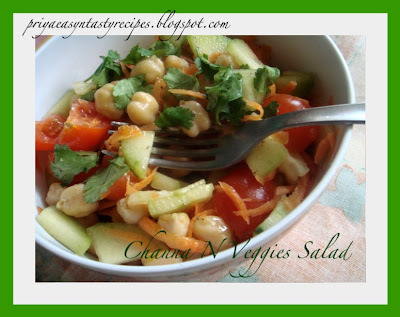 Mix the salt, pepper powder n oil together...add the channa n also the fresh vegetables together n toss with salt, pepper n Olive oil...serve them as salad...tinned channa also suits prefectly for this salad, but i like to use the dry chick peas..
Prefect Salad for any season!!! 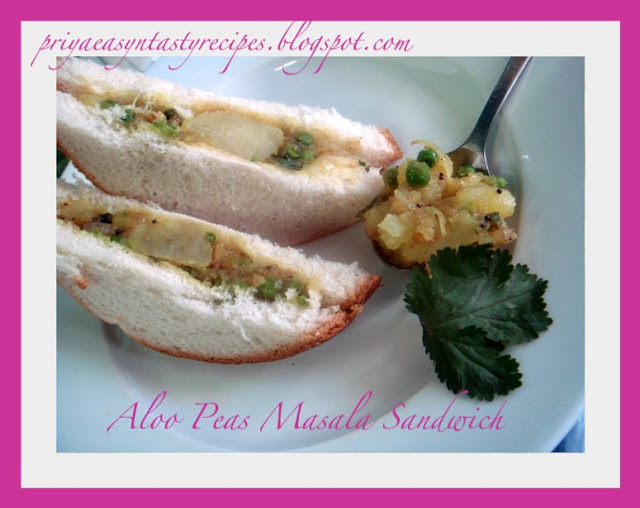 On the way to JFI - Chickpeas host by Something Foodie..
Take teaspoon of this masala n spread over the bread slice n serve as sandwich..
Add the active dry yeast, sugar , salt n luke warm water together in a bowl, mix everything well n keep aside for 5 minutes...Take a large bowl add the bread flour, oatmeal, cheese, pepper powder,egg replacer paste(mix the powder with warm water), add the foaming yeast to the bowl n mix everything well with ur fingers also add the olive oil to them n knead until they turn soft dough..cover it n keep in warm place for an hour r else until they double their volume..
Punch down the dough n place them in a greased loaf pan , again leave them in a warm place for another one hour until they double their volume...Preheat the oven at 350F n bake the bread in middle rack for 40 minutes r until the toothpick come out clean.. 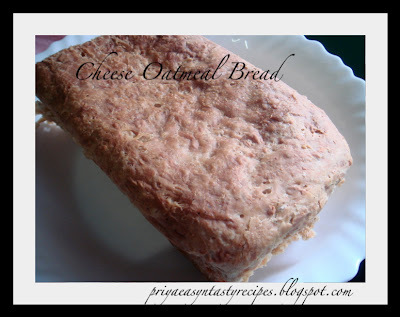 Healthy Oatmeal Cheese bread is ready!!! On the way to Yeast Spotting by Susan.. Broccoli is source of Vitamin C & A..The first thing that you should be aware of is that broccoli is a real powerhouse when it comes to vitamins. Not only does it include a large dose of vitamin C and vitamin A, it also has a healthy heaping of calcium, fiber, and folic acid. Broccoli is source of Calcium,you'll also find that it is an important source of calcium, which can help you build strong bones, control high blood pressure and contribute to the fight against colon cancer. You'll also find that broccoli is instrumental when it comes to a reduced risk for serious conditions including heart disease, cancers and even cataracts. 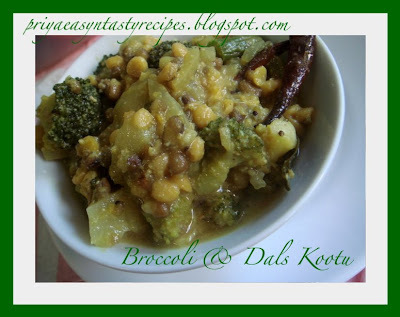 SInce long i wanted to prepare something spicy with broccoli n i prepared this kootu with channadal n whole green gram...Tasty kootu goes prefect with any spicy side dish with hot rice..
Soak greengram overnite in water..pressure cook channadal n soaked green grams upto 3hisses...Heat oil in a kadai, add the mustard seeds, cumin seeds,dry red chillies n asafoetida powder n let them splutters, add the chopped onion,chopped ginger n chopped tomatoes n cook until they get well cooked...meanwhile heat a tsp of oil n add the broccoli florets to the hot oil n fry them in simmer until they turns tender...keep aside..
Now add the cooked dals to the cooked onion n tomatoes pieces with green chillies..add enough water n salt,bring them to boil n let them cook for a while..finally add the already fried broccolis, curry leaves n grated coconut n just bring them boil n put off the stove.. 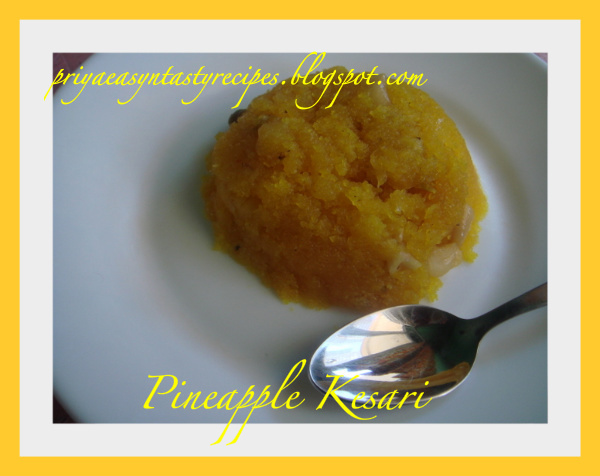 Serve hot r chilled as per ur wish!!! 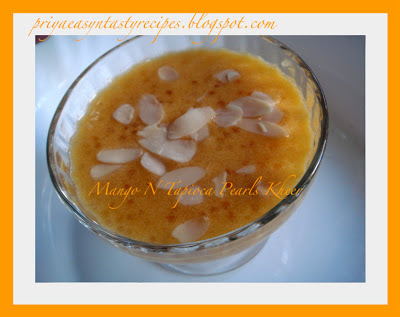 This delicious kheer goes to FIC - Yellow by Sunshinemom of Tongueticklers..
Wash thoroughly both raw rice n split moongdal together, pour four cups of water , jaggery, saffron strands n pressure cook them upto 3 hisses...keep aside n let them steam release..meanwhile fry the cashew nuts in hot ghee n keep aside, add the cardamom powder to the cooked pongal n fried cashew nuts n hot ghee n toss them gently.. 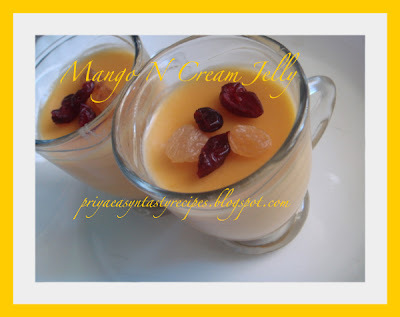 Serve hot n enjoy every spoon!!! 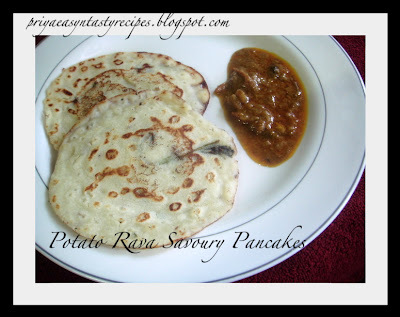 My Legume Love Affair - Seventh Helping host by Srivalli , event started by Susan .. Harvest - The Festival Of Rice by Sudeshna of Bengali Cuisine ..
Are you scratching ur head wat to do with leftover radish pieces??.. 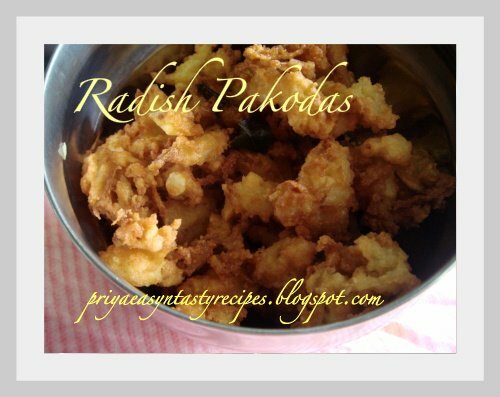 u might love this awesome pakodas coz they r prepared with grated radish pieces n channadal...i have seen them recently in a book n got tempted to try this dish with radishes.. this pakodas r really very tasty,crispy, handy also very good snacks n none will find out the ingredients u have used for this pakodas specially ppls who dont like radish at all...u can also prepare them as vadais, but i like the crispiness of pakodas i prepared them as pakodas instead of vadais..here comes the recipe.. Grind coarsely the soaked channadal, add the grated radish pieces,rice flour, chopped onion, chopped green chillies, crushed garlic pods n powdered fennel seed with enough salt n curry leaves.. bring everything as dough...meanwhile heat the oil for deepfrying n drop the dough as small dumplings r just springle dough as we with onion pakodas...fry them until they turn brown..fry them in small batches n in medium high flame..
Sending to My Legume Love Affair - Seventh Helping host by Srivalli, event started by Susan ..
Bring boil the water with sugar n pineapple chunks, let them cook until the chunks get cooked a bit...now add the lemon yellow food colour, salt, roasted rava, cardamom powder n cook until the water evaporates...meanwhile fry the cashew nuts in hot ghee n keep aside, melt slowly in simmer the ghee n pour little by little the hot ghee over the kesari..finish the ghee n add the fried cashew nuts..put off the stove.. 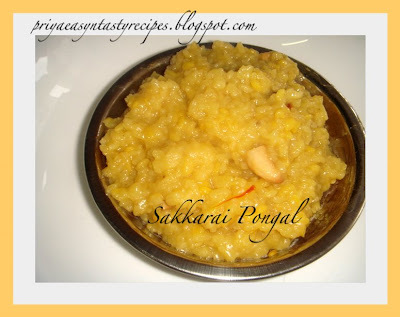 Serve hot..can store them in fridge for two r three days..heat the kesari in microwave oven n serve them hot..
Sending to FIC - Yellow by Sunshinemom of Tongueticklers.. Recipes For the Rest Of Us - Dessert host by Varsha, event started by Ramki ..
Soak the lentils overnite r atleast for 5 hours.. heat oil in pressure cooker n add the chopped onion n stir it until they turns transculent, add the carrot pieces to the onion , cut the chicken sausage into three small equal pieces n add the sausage pieces to the carrot n onion mixture, n stir it n cook for a while..
Add the already soaked horsegram n close the pressure cooker with the lid..stir it occasionally..after a while add the pepper powder n salt as per need with one cup of water n cook them with the lid closed for 15 minutes in simmer..put of the stove.. Serve hot with toasted bread slices...Healthy n also good while dieting..
Mozzarella Cheese Sticks, made with mozzarella Cheese, its a cheesy, tasty appetizier for kids n adultes, can be also a starters r else evening snacks with ketchup...Whoever loves cheese will fall in love with this cheese sticks..Mozzarella cheeses r soft, quick melting n really tastiest one..everyone at home like this cheesy sticks n quite simple to prepare them too..
Cut the mozzarella as long thick strips..press them with a paper towel to absorb excess of water..mix water with corn flour, pepper powder n salt as per taste as thick paste ..take the mozzarella pieces n dip them well until they r well coated with the corn flour batter . 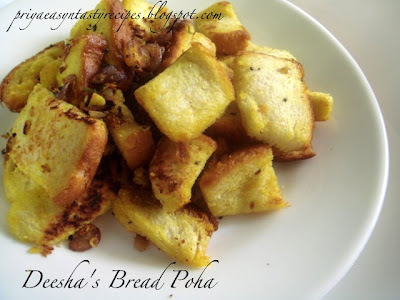 Now roll them in bread crumbs.. roll them well so that they will take a shape similar to cheese sticks..now dip them once more in corn flour mix n roll once again in bread crumbs..they will have double coating n ready to fry..before frying keep atleast half an hour in fridge. Heat oil in a pan.. oil should be very hot, fry the cheese sticks until they turn slightly brownish colour, dont fry them for a long else the cheese will melt n will stick with other cheese sticks too.. Cheese Sticks r ready to eat, serve them hot with ketchup r can also eat without any sauce.. 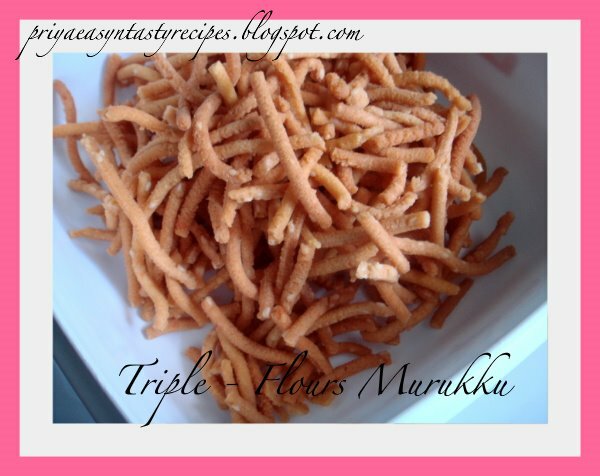 Kids will love this n will be very tasty while they r hot, cheese will melt in our mouth..
Winter season need always something crunchy for snacks n our traditional murukkus goes awesome with hot coffee for this season...here comes, my version of murukku prepared with three flours that is besan flour, rice flour n soya flour...recently i bought soyaflour to prepare my roti n parathas as more healthy, i didnt found any difference after adding soyaflour and they are quite healthy..for a twist i added to try my murukku with soyaflour, while making the murukkus the soya flour didnt change the crispyness, colour , taste..i am happy to try this murukku with soyaflour..
Heat the oil for deep frying in medium high flame..Take the muruku press, here i used thenkuzhal nozzle.. can use any sort of nozzle for making this murukku..take a small portion from the muruku dough, squeeze out over the hot oil n fry both sides until they turn brown...drain the excess of oil in paper towel..
Mangoes r my favourite fruit always, i love their flavour after strawberry...i was craving for mangoes n its kinda hard to find out mangoes here coz we r in winter season here.. while doing my shopping in Indian grocery, i saw Kesar Mango pulp tin n i bought immediately..since long back i was thinking to prepare some jellies n i made them out with mango n low fat cream with agar agar powder..they were very creamy n tasty..
Heat the cream in simmer with sugar n agar-agar powder..cook slowly until the agar-agar powder gets well dissolved...put off the stove.. add the mango pulp, mango essence n stir them well...pour them in cups r in ramequins...Keep aside n let them.. 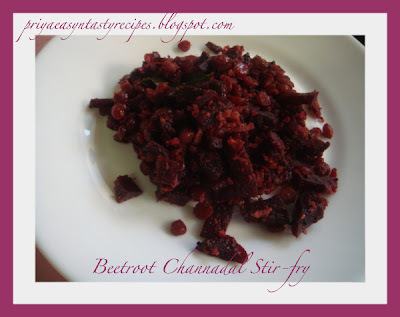 Arrange them in fridge for 2 hours..Serve them chilled, garnish with cranberries..
Soak rice n urad dal with fenugreek seed separately for 4 hours, grind them finely with enough salt..let them stand for fermentation for overnite..
Heat the oil in a kadai..add the mustard seeds ,urad dal, dry red chillies, asafoetida powder n curry leaves n let them splutters..add the chopped onion, chopped tomatoes, grated coconut, turmeric powder n curry leaves n stir them for a while,add this to kuzhipaniyaram's batter..mix everything well..
Wash thoroughly the ridge gourd peels n drain the excess of water..heat a tsp of oil n fry the ginger, garlic n red chillies pieces, tamarind until they turn brown n add the sesame seeds immediately n fry them until they change the colour...keep aside..Stir fry the ridgegourd peels in the same pan until they shrinks a bit..let them cool.. 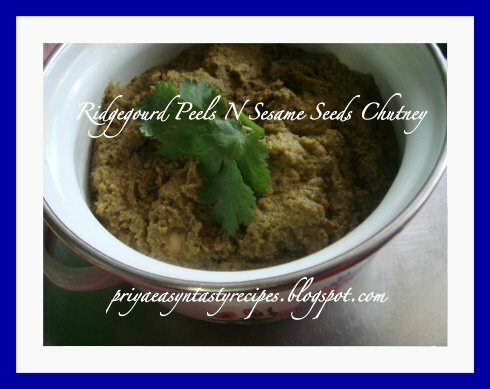 Grind them bit coarsely with enough salt..heat the remaining oil in a pan, add the mustard seeds, urad dal n curry leaves, let them splutters n add this tempering to the grounded chutney..